If you’re here because you have some pests in your life, you’re in the right place. 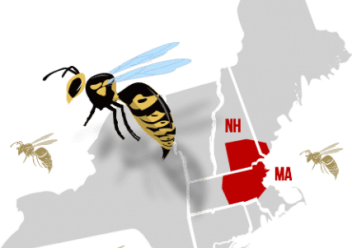 Colonial is one of the largest and most sought-after pest control companies in central and eastern Massachusetts, southern New Hampshire and southern Maine. Our service area runs from Worcester to Boston, Framingham and Natick to Andover and Lowell, Nashua to Manchester up to Portsmouth, Fitchburg and Leominster down to Milford and Franklin and includes all surrounding towns. We have developed the most effective pest treatment programs available today. Tens of thousands of satisfied residential customers can’t be wrong. We say what we will do, and we do what we say. Our technicians are highly trained, certified, have years of experience, and have the support of two on-staff entomologists. Our pest control treatments and preventative maintenance programs are proven effective and quite affordable. We have had exceptional experiences with your technicians. Thank you! Why should you call the professionals instead of trying to do it yourself? Professional pest control service is more comprehensive and more effective. Most do-it-yourself products are simply not that effective. Professional pest control technicians know exactly what to do, which eliminates guesswork and wasted time and effort on your part. Professional Exterminators follow careful safety procedures which are designed to get rid of the pest problem without risk to you, your family or your pets. And if you’re like most homeowners, you just don’t want to have to deal with it, and that’s why we exist! We provide professional treatment strategies for the full range of pests, including carpenter ants, pavement ants, wasps, yellow jackets, carpenter bees, roaches, stored-product pests (like indian meal moths), rodents and other occasional unwelcome “guests” such as earwigs. And, we use the Sentricon® Termite Colony Elimination System for proven effective termite control. The Sentricon® Termite Colony Elimination System is an innovative baiting system that acts like a security system, providing continuous defense. After eliminating attacking colonies, the Sentricon System guards structures by monitoring for future invasions. As a long-term solution that’s easy on the environment, the Sentricon System is the only subterranean termite protection your house will ever need. We welcome the opportunity to meet with you and to meet your pests. At that time, we will discuss your specific pest problem and outline the various treatment and preventative maintenance options offered by Colonial. In no time, we will get you and your family back to enjoying pest-free living! Chris M. Williams, Chairman & C.E.O. 1-800-525-8084 CALL TODAY FOR A FREE QUOTE! Thank you for the outstanding Customer Service! We were very pleased with the tech.